In practice for small rating alternators, the neutral ends of the three phases are connected to a single point. Hence it is not possible to introduce C.T. in each phase on neutral side as required in Merz-Price Protection. In such cases, the balanced earth fault protection can be used. The balanced earth fault protection is shown in the Fig. 1. At the outgoing side, the three C.T.s are connected in parallel as are connected in unrestricted earth fault protection. A single C.T. is connected on the neutral side in the pilot wire connecting neutral of alternator to earth. The neutral earthing is achieved through the earthing resistance. A relay is connected across the C.T. secondaries. Under normal conditions, the alternator line currents add to zero. Hence the vector sum of the currents through the secondaries of C.T. is also zero. Thus no currents flows through the relay and as neutral carries zero current hence no current is supplied to relay from neutral side. So relay is inoperative. If the fault appears at F2, at a position outside the protected zone then the sum of the alternator line currents is exactly equal to the current in the neutral. Thus zero currents flows through the relay is inoperative. But if the fault occurs F1 at which is the protected zone then vector sum of alternator line currents is different than the current through neutral side current transformer. 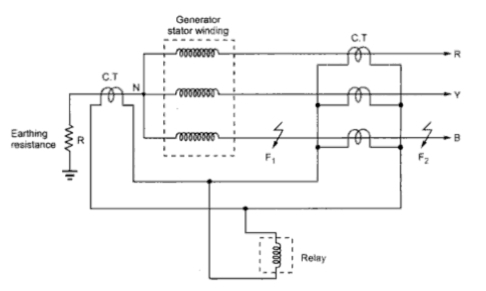 Hence a residual current flows through the relay. If this is greater than the pickup value of the relay, the relay operates. This trips the tripping circuit, opening the circuit breaker. By this scheme, the protection against earth faults is restricted to the region between the neutral and the position where line current transformers are installed.